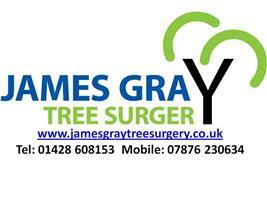 James Gray Tree Surgery - Garden Services, Tree Surgeon based in Churt, Surrey. James Gray is an expert tree surgeon with 15 years experience and qualified at Merrist Wood Arboricultural College with full NPTC qualifications. Based in Surrey, James Gray Tree Surgery serves a large proportion of the surrounding areas. We strive to achieve a high level of professionalism and complete customer satisfaction. All jobs are covered with full Public Liability Insurance for £2 million and we work to BS 3998 (British Standards) recommendations. We undertake works from private clients and sub-contracted works. Previous customers I have worked for include Hampton Court and Kensington Palaces, Westminster City Council, Surrey County Council, The Sculpture Park in Churt and Royalton Property Developers, along with countless private customers. Churt,Farnham, Haslemere, Bordon, Godalming, Hascombe, Hill Brow, Alton. Surrey and outer London.